Three strong films will compete for the #1 spot at the box office during what's bound to be a very healthy weekend. With Titanic 3D, James Cameron is poised to rule movie theaters yet again. Interest levels are incredibly high on Facebook and Twitter for the historical epic. Case in point: the official Titanic Facebook page has added more than 7 million likes since the first trailer premiered. That's a bigger like increase than The Dark Knight Rises and The Hunger Games managed combined during the same the same time frame. Titanic 3D is shaping up to be the ideal mother/daughter trip to the movies. As of 3 p.m. PT, Fandango reports that Titanic 3D accounts for a whopping 49% of daily sales. That total includes both 3D and IMAX 3D shows—3D accounts for 43% and IMAX 3D accounts for 6%. Look for Titanic 3D to grab $53 million from Wednesday-Sunday, $35 million of which should come just from Friday-Sunday. American Reunion also looks very healthy on Facebook and Twitter heading into its debut frame. The official American Pie page has more than 6 million likes, and the comedy is currently outpacing Bridesmaids on Twitter. Moviegoers are clearly ready to forget that the franchise has been cheapened by a string of lousy, straight-to-DVD entries. Fandango reports that American Reunion accounts for a modest 4% of daily sales. American Reunion should rake in $33 million from around 3,200 locations during its debut frame. After spending two weekends on top of the box office, it looks like the reign of Hunger Games will come to an end. Titanic 3D will steal away a lot of female moviegoers, and American Reunion will grab males 25-34. 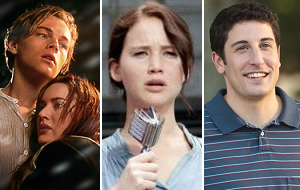 Hunger Games will need a surge in repeat business from die-hard fans if it wants to stay #1. Fandango reports that Hunger Games accounts for a solid 23% of daily sales. Expect The Hunger Games to grab $31.5 million during its third weekend of release. Wrath of the Titans Mar 30, 2012 Warner Bros.